Congratulations to all of the pupils who took part in the Bonus Round, and particularly to those who received awards. 2375 pupils were invited to take part in the Bonus Round and a total of 1496 lapel badges will be awarded. For your information the following table shows the distribution of marks for all schools participating in the final challenge and who returned their pupil’s OMR in good time. Awards have been allocated to those who have scored 14 marks or higher. 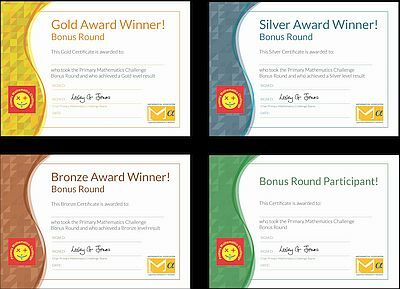 2019 is the Primary Mathematics Challenge 20th Birthday, so look out for offers and birthday surprises online!